We did the 4 T’s hike through Portland the other day. At one point you end up on 10th Street in downtown Portland at 2 food cart pods. I knew I could go to Aybla and get a great Gyro, but you know me. I like to try new things. It’s always a gamble, but it’s usually worth the gamble. I didn’t venture far from my last stop. 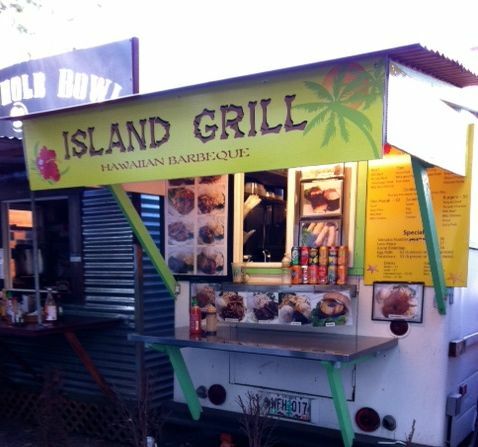 As a matter of fact I stopped just 2 carts down at the Hawaiian food cart, Island Grill. I saw that they had a regular and a mini. The mini was $5 and the serving sizes that come out of most of those food carts are quite large, so the mini was sounding pretty good. One of my favorite things about Hawaiian food is the macaroni salad. This was was a complete miss. I was not the only one in the group to eat at the place and the other girl said the same thing, not good. It didn’t have enough mayonnaise. Even us skinny chicks know you need tons of mayonnaise to make a good macaroni salad. I ordered the BBQ spiced pork. It was flavored well and tasted great. My friend got the teriyaki and she enjoyed hers as well. Sorry I didn’t take pictures, I was with a large group, we were in a hurry. All that to say my serving was so small it barely filled me up. Siting on the ground next to me was this guy eating something very, very large. When someone asked him where he got it he pointed in a general direction and said “It only cost $5.” Dang I chose poorly that day. I got enough to keep going and finish our trek through the city, but unfortunately this won’t be a stop I will be making again. Atmosphere is a typical food cart location. Be prepared to eat awkwardly or take it with you. Pricing was a bit steep, for what you get. Location is downtown Portland at 9th and Alder.